I can set 00:00 to 23:59:59 in one day and one month to 30 days.But if this is 2018/06/17, there should be only 17 days. I have to solve in some parts to get what I want. Now at 20:50:59 2018/06/17, preset usage = "LAST_1_DAYS" is 20:50:59, 2018/06/16. Hi, for a start change change preset="LAST_1_MONTHS" to preset="MONTH_SO_FAR"
That will give you from the beginning of the month. @mattfox I do not understand how to use it. Can i have a sample.I understand that if I use the last 1 months is now-24hr. Can I set up 00:00:00 - 23:59:59 one day? 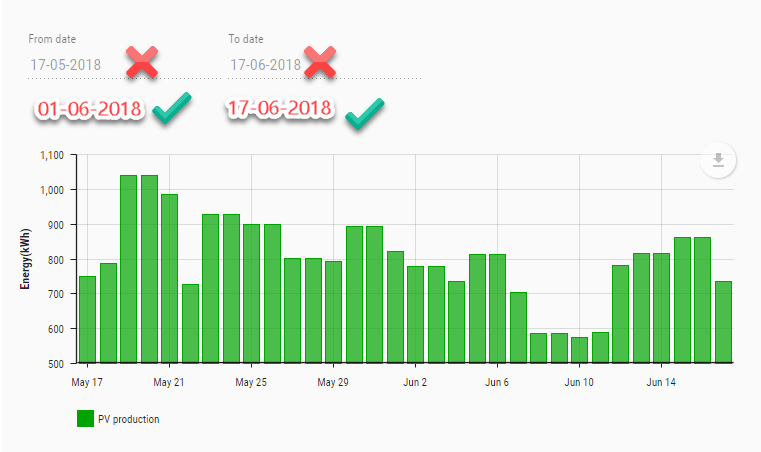 Are you requiring the ability to both select this month to date or show the whole day, or can they be two separate charts? Noting that if the date-range-picker is changed, you would have to manually update the end time yourself. @DESLE I can't quite work out what exactly you are looking for. Hopefully what @MattFox provided might help you. Like he said it seems that you just need to use preset="MONTH_SO_FAR" and a rollup of 1 day. Can I set up 00:00:00 - 23:59:59 one day? Just remember that with date/time ranges the start is inclusive and the end is exclusive. e.g. if you query the API for 2018-06-17 00:00:00 to 2018-06-18 00:00:00 and there is a point value at exactly 2018-06-18 00:00:00 then it will not be returned.